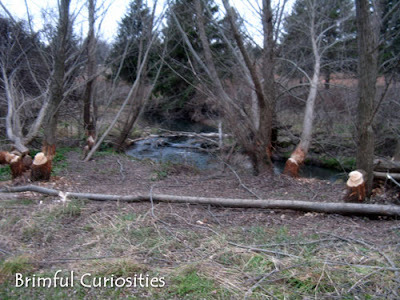 A few weeks back we noticed several trees cut down by beavers along one of the walking paths. My daughter didn't express any interest in the trees though. She wanted to see a beaver, and there weren't any in sight. What an exciting find! Maybe you'll be able to spot one n the spring when it's a little warmer! We have a beaver lodge in the creek across from my parent's house. It's always exciting to try to catch a glimpse of one! They really did that! That's fascinating! Wow! That is awesome! So fascinating. That is so cool! Maybe you'll find a dam somewhere nearby soon! Wow that is cool. Beavers are good at hiding. That is really neat!! And look how interesting the aftermath is! 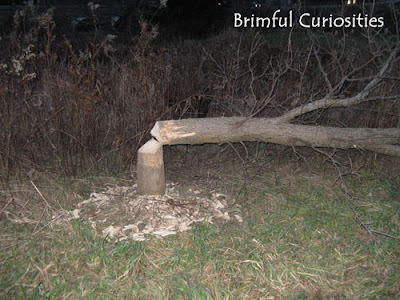 Gosh, I dont think I have ever seen a tree that was actually cut down by a beaver. I admit I would look for the beavers too. How cool? I never knew what it looked like if a beaver had gotten to a tree...wow! Wow. They did that??? That is awesome! Oh my! I've seen a few like that when I go on hikes and whatnot, but they weren't really that pronounced. amazing that they can do that!Thanks for sharing! Whoa, sure hope that's not too close to your house. So I bet your daughter wants to go back again to see a Beaver huh? Children are so inquisitive aren't they. I am your latest follower. Won't you stop by me if you have time and become mine? It's nice to know they haven't all died out! Cool shots. I would want to see a beaver too. Wow, how cool! I have never seen a beaver, nor have I seen a tree cut down by one!